Pretty grey eyes with makeup of any colour and you will look amazing. 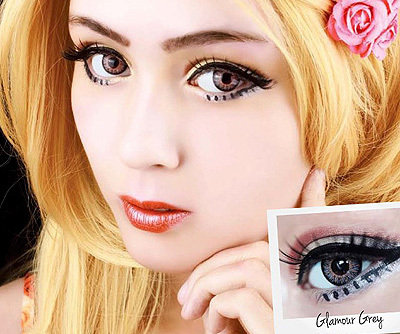 Combine these gorgeous ColourVue Glamour Grey contacts with coloured make-up and look astonishing. Apart from giving your eyes a pretty grey colour, they also make them seem bigger thanks to their outer black ring. These grey contact lenses feature an amazing Aztec pattern that has a mesmerizing effect. Thanks to special blending technology incorporated during production, ColourVue Glamour Grey contacts are very comfortable to wear.